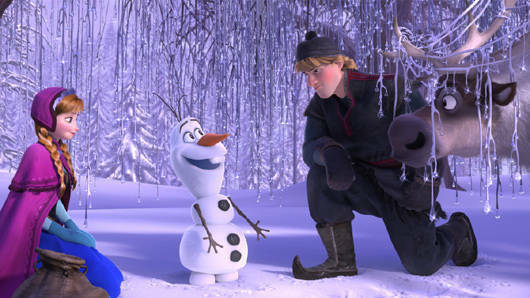 Disney’s latest animated feature gives Hans Christian Andersen’s "The Snow Queen" a cool makeover. STORY: Princess-turned-queen Elsa (voice of Idina Menzel) flees the kingdom of Arendelle after she accidentally plunges it into eternal winter on the night of her coronation. Hoping to save the kingdom, Elsa's younger sister Anna (Kristen Bell) embarks on a perilous search to find her cursed sibling, teaming up with hunky ice seller Kristoff (Jonathan Groff) and a talking snowman named Olaf (Josh Gad). Frozen is a computer-animated musical based very loosely on Hans Christian Andersen's 1845 fairy tale, "The Snow Queen." A tale of two sisters. Has there ever been a Disney animated feature whose story was more about the bond between two sisters than it was about a young lady's wish to marry the perfect Prince Charming? In The Little Mermaid, Ariel had sisters, but they did nothing to advance the story. Cinderella had sisters, but they were wicked and of the "step" variety. 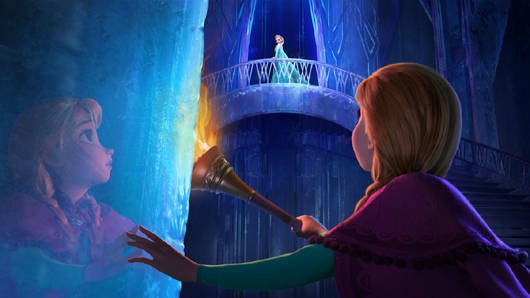 With Frozen, Disney has given animation fans something new and groundbreaking-an instant classic about sisterly love. 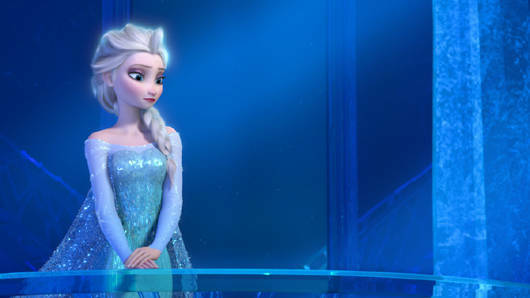 You won't soon forget the delicate and nuanced tale of Elsa and Anna, whose deteriorating relationship is chronicled movingly in the song, "Do You Want to Build a Snowman?" 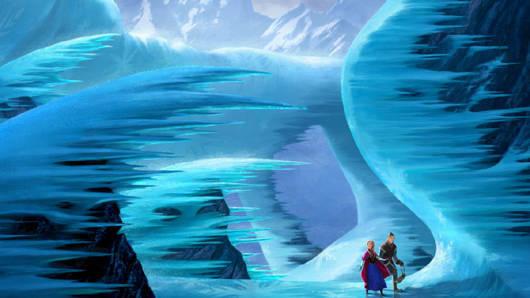 Elsa hides away in an ice castle in the mountains. The show-stopping "Let It Go." Right after she unintentionally freezes her kingdom, Elsa flees Arendelle, exiling herself in the mountains. In a secluded, desolate area, she builds her own fortress of solitude while belting out the emotionally-charged "Let It Go." Crystals grow, resplendent reflections glow, and golden light rays are refracted into shimmering prisms as her castle rises from the snow in the most magnificent showcase of crystallization since motion pictures were invented. If Frozen is as successful as it deserves to be and prompts Disney to make a live version of it on Broadway a la Lion King and Beauty and the Beast, "Let It Go" will surely be the most difficult number to pull off onstage. The surprise of "In Summer." The trailer for Frozen didn't seem promising. With its emphasis on slapstick gags showing Olaf, the talking snowman, misplacing parts of his body and face like some Nordic Mr. Potato Head, I didn't expect much from the movie. After all, isn't a trailer supposed to show or hint at a movie's best bits? But then, I saw the film in its entirety. My low expectations were gradually eroded by the bedazzlement that Frozen unleashed. 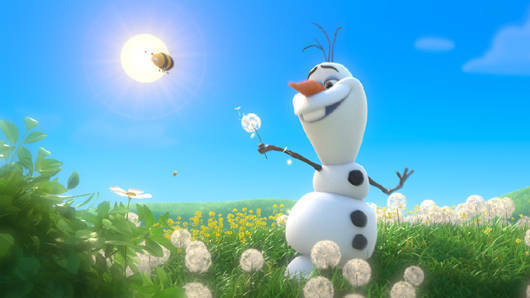 My low opinion of the Olaf character, however, remained unchanged as one unfunny gag after another involving his snowman parts was delivered by comedian Josh Gad, sounding a bit too much like John Leguizamo's Sid from the Ice Age movies. 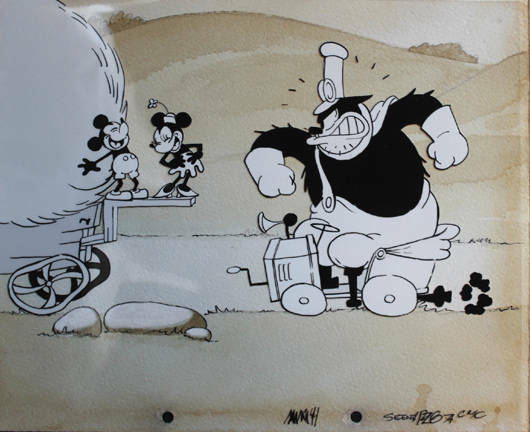 Every instance the snowman appeared felt too long, the freshness of many gags involving him lost because they had been used in the trailer. Then came Olaf's song, "In Summer." As he crooned about the one thing he wants most out of life, my hatred for him quickly melted away, my two-sizes-too-small Grinch heart growing three sizes bigger from the huge laughs I was getting at Olaf's expense. As a warped number where an innocent, child-like being wishes for the very thing that could kill him, there's never been quite a song like this in any musical I've seen, by Disney or any other studio. The short film "Get a Horse"
Bonus short film: "Get a Horse!" In celebration of Mickey Mouse's 85th anniversary, Disney is screening this short prior to Frozen. FYI, that is the voice of Walt Disney himself coming out of Mickey's mouth! Vintage, hand-drawn animation meets hi-tech digital wizardry in this "reel vs. real" romp, which blends the plot device of the 1993 Arnold Schwarzenegger film Last Action Hero with the physics-defying charms of the Pixar short, Presto. I didn't see Frozen and Get A Horse in 3-D, but the prospect of seeing a black-and-white Mickey coming out of a 2-D movie screen and being transformed into a full-color character in a three-dimensional world is too irresistible to pass up. It's aching to be seen in 3-D! Merely competent song lyrics. Though I counted three songs among Frozen's many pluses, I have to admit that the merely okay lyrics of these songs made me miss the witty elegance and inventiveness that the late, great Howard Ashman brought to the songs he wrote for The Little Mermaid, Beauty and the Beast, and Aladdin. Where it's easy to remember both the images and lyrics associated with production numbers like "Under The Sea," "Be Our Guest," and "Friend Like Me" from those three Disney classics, the same can't be said of the songs from Frozen, which were written by the husband-and-wife team of Robert Lopez and Kristen Anderson-Lopez, who, incidentally, also wrote the songs for The Book of Mormon. Though I won't ever forget wondrous images that accompanied Elsa's "Let It Go" number, I can't remember any lyrics other than her emphatic refrain to "let it go." IN BRIEF: Magical, moving, and gorgeously animated, Frozen is "sisterrific" family entertainment from the Walt Disney Company. It's right up there with recent hits Tangled and Wreck-It Ralph.